This cake was the stepping off point for the inspiration behind the food at my party. I found it on Pinterest, but I am giving you the link directly to the website which it is based from....because I think credit should be given where it is due! 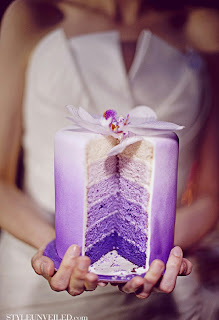 So my baker, Yumi's Bakery, created a very similar cake. Only they topped it with the lavender roses...and I finished it off my surrounding the base of the cake with the roses as well. Also in this picture you see red velvet cupcakes with cream cheese frosting (my favorite), chicken salad sandwiches, meat and cheese platter, veggie platter, freshly made pico de gallo and guacamole, and chips. On the other side of the island was the chocolate. It was suppose to be a chocolate fountain, but the heater never heated, so we threw the chocolate into a crock pot. Still tasted good! We had salted nut rolls, strawberries, rice krispy treats, pineapple, & bananas for dipping into the chocolate. Don't these strawberries look so fresh and yummy! The inside of the cake! I later heard that one of the guest was just certain that this cake was grape flavored! Nope...it was just white cake with regular frosting inbetween the layers and fondant on the outside. The cake did lean a bit...but still turned out great! I have made these stacked cakes many times before (never with fondant) but one of the most important things is to freeze it every couple of layers..for a couple of hours before adding your new layers. Otherwise you will get a leaning cake. These were mini quiches! They were my favorite right behind the cupcakes! In all...the foods were easy to handle, finger foods. The only thing the forks were required for were for the cake. I wanted to create an environment where people mixed and mingled. I pulled all the chairs away from my tables and island and placed them throughout the house. I think all of these foods worked great for this atmosphere! My next post will be about the party drinks!